If you're a gamer with expensive tastes and a bank balance to support it, you need to check out the Arcade 80s Trunk, the ultra-luxury stand-up arcade cabinet from French designer Fred Pinel. Among gamers, owning an arcade stand-up is a real status symbol. They're not cheap, you can't just nip over to the local Walmart to pick one up and they demand a relatively significant amount of otherwise-unused space in the home, so obviously they're not for everyone. But true luxury is a matter of degrees and while your Neo-Geo cabinet may be cool, it's got nothing - I mean, absolutely nothing - on the Arcade 80s Trunk from Pinel & Pinel. This game-room bad boy comes in two versions, "Classic" and "GT," with glued and stitched leather, a chromium-plated dashboard, customizable colors and calfskin dressing, with crocodile and shagreen available upon request. 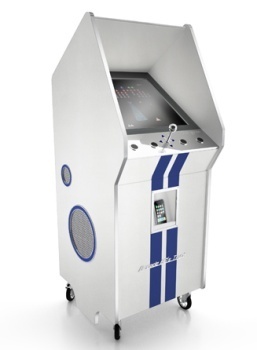 On the tech side of the equation, the Arcade 80s Trunk features a 1080p LCD screen and a 1400 watt "very high definition" sound system with an iPod dock that will rattle your teeth at 110 decibels. And what's an arcade cabinet without some games? The Arcade 80s Trunk includes 60 "unforgettable" classics including Pac-Man, Space Invaders, 1942 and, judging by the promotional image, Galaga. So how much does something like this cost? If you have to ask, you can't afford it, so prices are posted. Here's a hint, though, just to give you an idea of what you're dealing with: The French edition of Vogue for December 2009 features an exclusive Courchevel ski set designed by Pinel & Pinel, with bindings, poles, gloves, mask and a glove box. The price: $64,500.